March 27, 2019 – Edmonds, WA – Wibu-Systems will exhibit its recently introduced CodeMeter Triple Mode Redundancy (TMR) Server at Hannover Messe, April 1 -5, 2019, in Hanover, Germany (booth C15, hall 6). 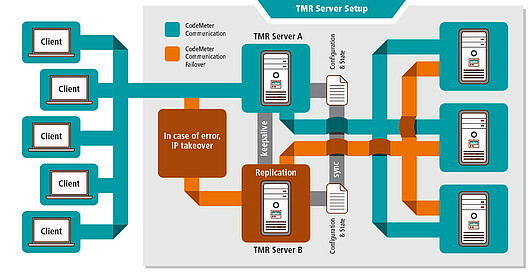 The TMR server solution combines high availability, high performance, and uninterrupted license use during license updates. As a result, server outages or license usage peaks in networks no longer have to mean service disruptions: All purchased licenses are reliably available. CodeMeter, Wibu-Systems’ flagship technology for protection, licensing, and security, provides software publishers and intelligent device manufacturers with 23 preset software license models. With the High Available License, the user can own a redundant license server; the 2-out-of-3 architectural principle ensures the availability of software in the event of a license server failure, providing uninterrupted license updates. To the user, the entire TMR system appears as a single entity. Although there is enormous complexity in the architecture to ensure that high availability is coupled with industry-leading protection and security against license fraud, everything has been designed with “business as usual” as a core feature. This architecture works because every license is created in triplicate and given a special TMR ID as an additional property. The three licenses are placed into three separate license containers (CmContainers) that also have the same identifier; the TMR group can then allocate the software or hardware-based CmContainers with the same ID to a virtual CmContainer. This is ultimately the one and only license container the end users see, so for them, everything works as normal.